DISCLAIMER: The version of this film that was seen for this review is the one aired on CNN on January 4, 2015. As a result of its TV broadcast, the movie was edited to accommodate broadcast standards, commercial interruption, and its two hour timeslot. What do you say? How do you write a review of a movie about a man who helped shape the current state of movie reviewing? What I can say is that director Steve James has crafted a wonderfully emotional, if not necessarily memorably great documentary. 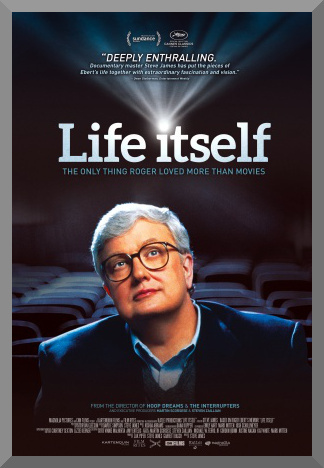 We can sit and argue all day the debate that is briefly addressed within Life Itself’s 121 minute space, the belief that Roger Ebert (1942 – 2013) and his TV reviewing partner Gene Siskel (1946 – 1999) irrevocably “cheapened” the status of American film criticism as a binary “thumbs up, thumbs down” profession, as introduced on their long running syndicated review show. But that’s a discussion saved for another day, because as its title, based on Ebert’s 2011 autobiography suggests, Life Itself is about life, the life of one man in particular and the enjoyment and fulfillment to which he occupied it through his many interests and pursuits, but also what it means to have a life well lived – one that can radiate positively and influentially to others, one that can still shine bright through the filter of flaws and shortcomings are carried as a result of living in the first place. It is fitting that it would be Steve James that would make a film about Ebert – James’ most well-known and championed documentary, the great Hoop Dreams, rose to prominence after it was heavily featured and praised on Siskel & Ebert in 1994. And his work here is respectful and solid, but by no means a hagiography. The film traces over Ebert’s life and career, from an interest in writing and journalism that stemmed from childhood, to his stint as The Chicago Sun-Times’ movie critic that started out of the blue when the previous holder of that position retired in 1967. The degree of focus on milestones and achievements is expected, and delivered in a similarly traditional and predictable way, but it also addresses the man’s shortcomings, such as the alcoholism that he battled until becoming sober in the late 1970s. Life Itself devotes a bulk of time to Ebert’s last months, around the time that James started filming, and when the cancer that claimed his lower jaw, rendering him mute and unable to eat and drink in any manner except a feeding tube, returned, in a bout of illness that eventually proved fatal on April 4, 2013. At one point, Roger even correctly predicts that he will likely not be alive by the time the documentary will be completed. But these segments are not a pity party, but rather an example of how he continued to write and work, right up to the end, and the strength exuded by both him and Chaz, his wife of over twenty years. At one point, a passage by the book Life Itself is quoted, where Ebert says of his family “There are no strangers. I love and I am loved”, a statement which certainly rings true both with specifically shot footage and home video clips, offering a look at our subject’s personal life, but not to the point where it becomes boring or needless – sometimes with biographical documentaries, people don’t seem to realize that no one’s interested in watching every home movie ever. But James is aware, and uses such archival footage sparingly. But in speaking in Ebert’s professional life, the one thing that James is able to compel the most is how a man who was a film critic by trade still could have written about nearly anything. And he has. The movie discusses his many published works, from travel guides to serialized fiction. Looking at his full bibliography now, at one point he even wrote a cookbook detailing recipes that can be made with rice cookers. Ebert even had a brief foray into filmmaking itself (in a way), co-writing the screenplay for Beyond the Valley of the Dolls, a 1970 movie directed by infamous sexploitation auteur Russ Meyer (1922 – 2004), a film that, while largely dismissed upon its release, in subsequent decades, has gained critical support and even cult status. “Beyond… the valley of the dolls… now this is a title,” comments Martin Scorsese, one of Life Itself’s many interviewees, which range from filmmakers, to professional partners, to longtime personal friends. This blend ensures a look at its subject that is thorough and well-rounded. Life Itself didn’t connect with me or affect me in quite the way that it seems to want to, or in the way that it has successfully done with many who had admired his career for longer than I have or those who worked directly with Ebert in some capacity (curiously, Richard Roeper is not interviewed at any point), however, I still found it to be informative and touching in its final moments, hopeful for Roger’s legacy to be carried on. And by not shying away from both the physical and mental tolls from his cancer that were so ubiquitous at the end of his life, there is not only a sense of a more complete portrait and depiction, but a better appreciation of the perseverance that existed, with Ebert writing up until only a couple of days prior to his death, proof that while Roger Ebert’s physical voice may have been replaced by a computer text-to-speech program, and his body may have become increasingly fragile, his warmth, wit, humanity, and passion for just about everything was deeply engrained, and remained a part of him until the very end.